ANAHEIM, CA - (August 11, 2015) - Plans to open ARTIC’s food and dining establishments, including unique concept dining establishments, an organic coffee bar, a pretzel and frozen yogurt kiosk to complement the existing grab ‘n go food and grocery store, are moving forward and soon residents, guests and commuters will experience ARTIC as more than a transportation hub. 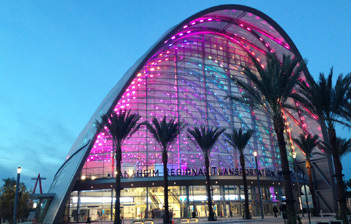 Opened in late 2014, ARTIC offers full-service transportation options, including services of OCTA, Metrolink, Amtrak, Anaheim Resort Transportation, shuttles, taxis, bikes and more. Located between Honda Center and Angel Stadium of Anaheim, ARTIC’s central location is just two miles from the Anaheim Resort, and offers commuters convenient access to all of Southern California’s destinations, and beyond. Visitors will soon be able to experience ARTIC’s full-service food and beverage establishments for a night out, before or after a game or show, as a business meeting location, or a gathering spot with friends. Great memories are formed around great food. Here is a sneak peek at what to expect in the coming months. Cajon Creole style dishes, including seafood, chicken and sausage, will be freshly prepared in bubbling in steam kettles in front of patrons. Ritter’s other Orange County locations garnered the #4 spot on OC Food List’s “Top 30 Restaurants in Orange County” in 2014. Fresh seafood and raw oysters shucked live is what guests can expect from The Oyster Bar. The menu will be updated daily to reflect the freshest harvests from around the world. The Alchemists are well-known for their taste in creative design, food and beverage. Guests will be able to enjoy “build your bowl” concepts with fresh food selections, burgers, fries and meat pies, an open air cocktail bar, or participate in test beverage flavor combinations. Offering environmentally conscious coffee and teas, organic, homemade food and beverages, The Lost Bean will soon become a favorite with coffee aficionados, with the added benefit of its being a strong socially conscious business. A portion of its proceeds from sales at ARTIC will be donated to local charities in and around Anaheim. Visitors will be able to choose between Auntie Anne’s warm and soft, freshly baked pretzels, or the cool creaminess of Pinkberry’s frozen yogurt. Or both! Mission Market offers a great selection of grab ‘n go foods and grocery products. In a hurry? Mission Market’s convenient hours have something for you. For information about ARTIC and to learn more about the transportation services and dine + shop options, please visit www.articinfo.com.